Description: returns the screen dimensions of the primary monitor (windows display settings). The dimension information is displayed in a message box. Example output is shown in figure 1. Fig 1. 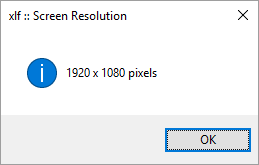 Screen dimensions message box - displaying the output from the GetScreenResolution macro. Place code 1 in the module declaration section. This function declaration tell the VBA interpreter that there is a Windows API function named GetSyetemMetrics located in the Windows user32.dll file. The PtrSafe keyword in code 1 line 1, allows the function to run in a Windows 64 bit and Windows 32 environment. PtrSafe was introduced in VBA 7. Run code 2 to display the message box shown in figure 1. MsgBox w & " x " & h & " pixels", vbInformation, "xlf :: Screen Resolution                                "